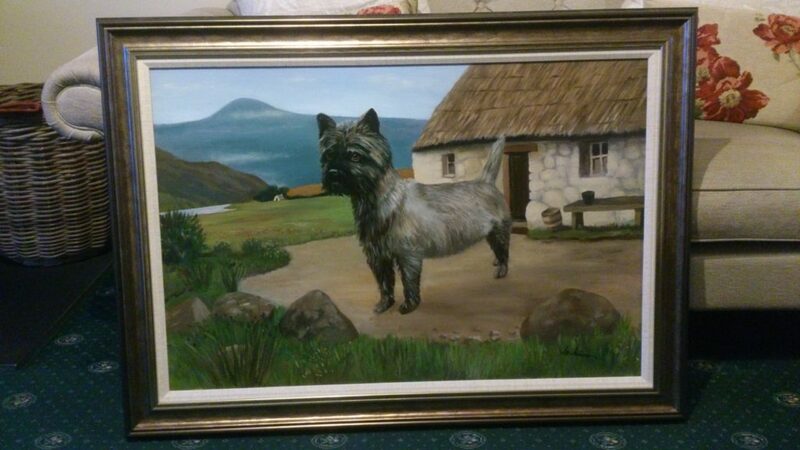 Recently I completed this oil painting of “Billy” the Cairn Terrier which a friend of mine commissioned. As you can see from the photo, the painting is on a much larger scale than I usually do, so it took me considerably longer to finish than normal! My client wanted a large painting and we discussed the possibility of including a Scottish croft in the background, since he had been brought up on a croft as a boy in Fife. I created the background to suggest the Lomond Hills in the distance and placed “Billy” in the foreground, as if he is anxiously waiting for his master to return. This painting stretched me beyond the limits of what I normally do but I think the end result worked out “no’ too bad” as they say in these parts!